*This rate would apply to the additional person, below 12 years of age. welcome drink on arrival. Buffet / Fixed menu breakfast, lunch and dinner in standard buffet meal venues. Happy hours at the Atrium Bar. Pay for one – Get Two, 1500 hrs to 1700 hrs. Complimentary bottle of Goan wine on arrival. Complimentary half day sightseeing. Fixed departures & itinerary. Complimentary replenishment of beverages, once during the day, for the in room Tea/Coffee maker. Complimentary accommodation for one child below 12 years, in the parent’s room without an extra bed. Complimentary daily activities for children. Complimentary use of gymnasium and swimming pool. 20% Discount on the Resort’s outdoor and indoor Recreational facilities. Please Note The above tariffs are inclusive of currently applicable taxes. For Xmas eve & New Year’s Eve the rates include gala dinner on Christmas & New Year eve. Extra Adult rate is inclusive of Extra bed. Two nights package would be at 75% of 3 night package and does not include sight seeing. Rates for single occupancy would be 85% of double occupancy rates. Extension would be on pro-rata basis, with in the period slabs. The above mentioned rates are highly confidential and are not to be disclosed in the market. Ramada Caravela Beach resort, offers a vast choice of accommodation. 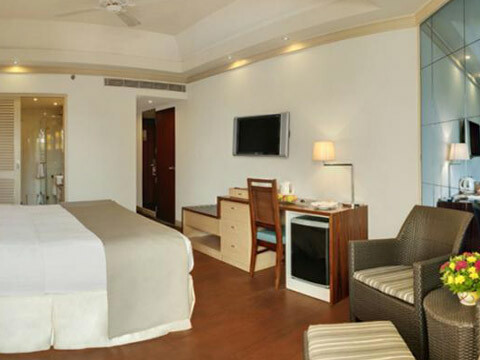 From the standard room, situated amidst the lush greens to the Presidential Villa, a luxurious abode for a privileged few. 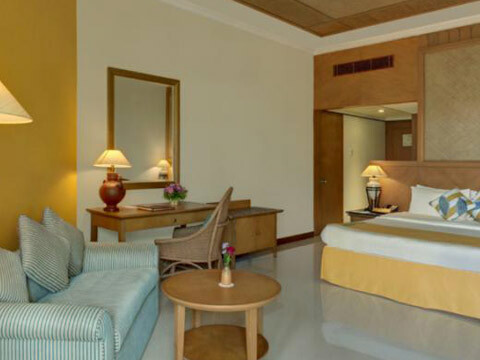 The rooms feature furnishings and decor, that blends in with Goa, bathrooms, a relaxing sitting area, individually controlled air conditioning, satellite television, International Direct Dialing telephones, minibar and working desks. The furnishings and fabrics have all been exclusively designed to complement the beach location. All the rooms have a private balcony with sun chairs, overlooking either the gardens or the pool. 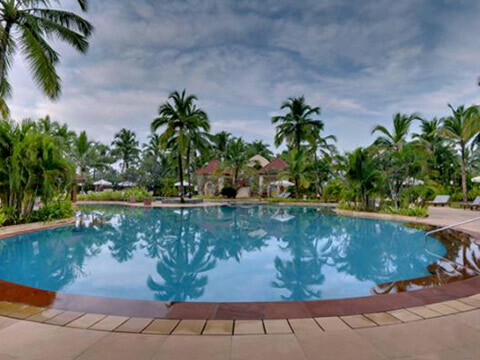 The Ramada Caravela Beach Resort, is Goa’s finest International Beach-front resorts. An ideal place for Relaxation, Romance, Self-discovery, Escape, Excitement, Rejuvenation, Solitude, and Sheer Thrill, it offers all the space one needs. From the creators of the famous Sun City in South Africa, The Ramada Caravela Beach Resort is exclusively designed by Wimberley, Allison, Tong and Goo. Located at the serene white sands of Varca beach, the 199-room resort sprawled over 24 acres of refreshing green, is an architectural treat. From the moment one steps into the invitingly open lobby, one can loose themselves in a world of stimulating beauty. The beautifully designed 80-ft. Atrium lobby fitted with high arches and wooden beams is reflective of old Goan architecture, and adorned with a mural by renowned Goan artist Mario Miranda. 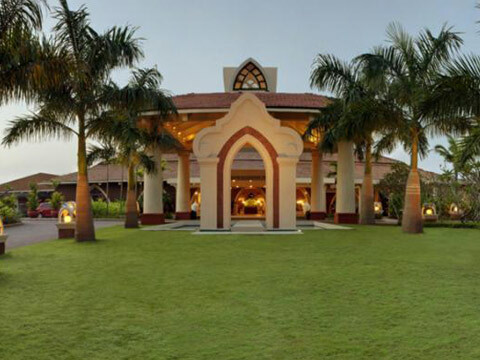 The lavish Guest Rooms, Suites and Villas endowed with private balconies and a spectacular view of the ocean, overlooking lush landscaped gardens and Goa’s largest pool. 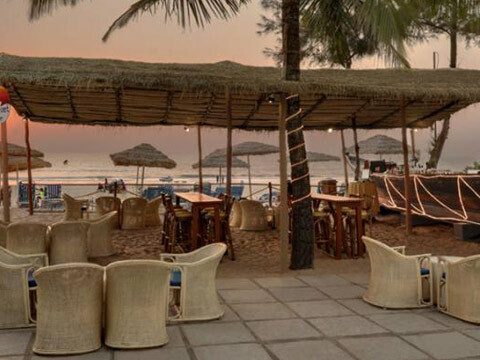 The Ramada Caravela Beach Resort, is Goa’s finest International Beach-front resorts. An ideal place for Relaxation, Romance, Self-discovery, Escape, Excitement, Rejuvenation, Solitude, and Sheer Thrill, it offers all the space one needs. From the creators of the famous Sun City in South Africa, The Ramada Caravela Beach Resort is exclusively designed by Wimberley, Allison, Tong and Goo. Located at the serene white sands of Varca beach, the 199-room resort sprawled over 24 acres of refreshing green, is an architectural treat. From the moment one steps into the invitingly open lobby, one can loose themselves in a world of stimulating beauty. 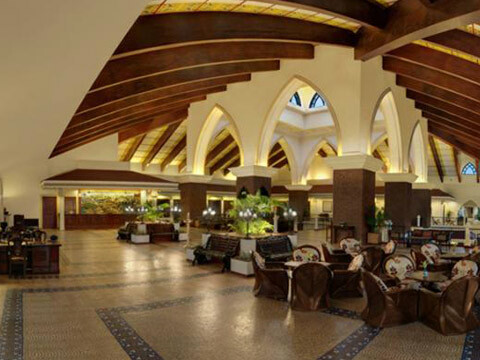 The beautifully designed 80-ft. Atrium lobby fitted with high arches and wooden beams is reflective of old Goan architecture, and adorned with a mural by renowned Goan artist Mario Miranda. The lavish Guest Rooms, Suites and Villas endowed with private balconies and a spectacular view of the ocean, overlooking lush landscaped gardens and Goa’s largest pool.